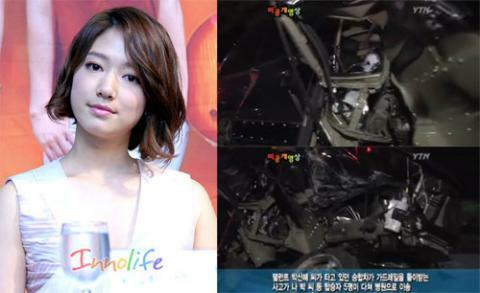 Actress Park Shin Hye was involved in a car accident at 11:30pm last night (July 18), and is currently hospitalized. 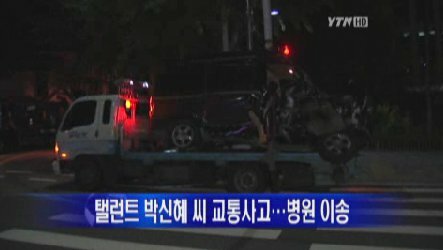 According to the police, Shin Hye's manager Kim Mo(age 26) was driving a Starex van on a highway at Seongnam, Gyeonggi-do when she suddenly crashed into a metallic guide-rail that separates two roads. The vehicle was destroyed severely by the blow, with the front-half of its body demolished and its wheels detached. Park Shin Hye, her manager, coordi and other 2 people in the car were sent to the nearby Konkuk University Hospital where they are examined and hospitalized. Fortunately, Park Shin Hye only suffered minor injuries because they were all wearing safety seat-belts. She will be spending a day resting at the hospital and then return to filming MBC drama 'Heartstrings' tomorrow. Meanwhile, the underlying cause of the car accident is still under investigation. The police suspects that it was a result of Ms Kim's fatigue, drowsiness and possibly careless driving. Let's wish Shin Hye and her friends a speedy recovery. Get well soon everyone! Thanks god only minor injuries. I'm so happy. Shin-hye, I pray for your speedy recovery. Get well soon! Besides praying for Shin-hye, pray for Mr Kim and others as well. Everyone take care. I'm so glad everyone was ok. Thank god no major injuries. Was so worried when was told the news of the accident. Praying for everyone's fast recovery. I'm glad she's fine already. Thank god. Thank goodness you al lgot out alive. Judging from the photos the car is destroyed to a point that it's unrecognizable. hope everybody will be fine..
Oh noooooooooooooooooooooooo.​ Take care Shin Hye Unnie! get well sooon! May no harm cm to u.
Shin Hye!! Hwaiting!!! Everything is alright now.. Thank God! watch this video is too scary.. Shin Hye ..get well soon..please take a rest..
shin hye you must well!.. Joyful to learn you are all safe...Get well soon. God protected you all! God is in control! Hope you'll recover from the trauma! Very happy that she only has minor injuries. I hope you will get well soon Park Shin Hye! Fighting!! THANK GODNESS!Please recover soon so we can see you.Please tell us that you're OK!! !Please please please!!!!!!!!!!!!!!!!!!!!!!!! Thanks God that you n your company is ok,get well soon and recover soon.I love You Park Shin Hye and I will always pray for your life n your sucses!!!!! I am so sad ... oh thanks god there were no serious injuries!I pray for your speedy recovery! Thank God we had no major mishaps, but if it was exhaustion should rest, although the type of work is Park Shin Hye is demanding, and it being a super professional work, she should demand the maximum towards his beloved fans. But I hope that she and her teammates and manager to not rest will occur thanks. Thank God for all of them are excellent people and that well preserved. Go on Park Shin Hye. ahhhh!really glad Shin Hye's okay,as well as the others! Thanks God!let's all pray for their fast recovery! ahhhh!really glad Shin Hye's okay,as well as the others! Thank God!let's all pray for their fast recovery! I hope she recovers from that accident immediately. Get well soon. Everyone is praying for you. Based on the pictures I could see that the damage on the cars was severe. I'm glad she didn't get serious injuries. I'll be praying for her. The accident is a bit serious and I hope she's fine. I'll pray for her immediate recovery. All of us will be praying for your immediate recovery. Get well soon! Aww sad... Explains those big bruises on her shins in a few scenes. I was curious what those were all about.